The one day conference kicked-off on Monday, April 20th, with a discussion on overcoming obstacles to speed up the deployment of biomass thermal solutions. Tony “T.J.” Morice, the newly appointed Co-Chair of HTM and Vice President of marketing, operations and business development of the Marth Companies, opened the conference by congratulating Brian Brashaw, former Director of the Wood Materials and Manufacturing Program, on his tenure as HTM Chairman. Four presentation sessions followed, addressing topics like policy, project development case studies, combined heat and power, and financing. The conference concluded Monday evening with a reception on the floor of the International Biomass Conference. Grand Forks, ND (12/30/2014) – BBI International, owners and organizers of the International Biomass Conference & Expo, reported this week that Heating the Midwest, an important regional conference focusing on biomass derived thermal energy will be co-located with this year’s conference. 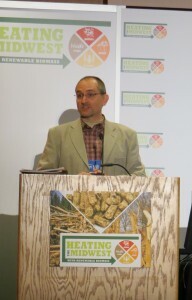 Heating the Midwest will be held on Monday, April 20th at the Minneapolis Convention Center and will bring together leaders of the woody and agricultural biomass industry interested in supporting and expanding the use of biomass for heat and combined heat and power in the Midwest. Heating the Midwest attendees will have an opportunity to visit the trade show floor on Monday night at the International Biomass Conference & Expo’s opening reception. The International Biomass Conference & Expo will continue through Thursday, April 23 and is expected to attract nearly 1500 attendees. Click here for Information on Heating the Midwest’s program, tour and sponsor/exhibitor opportunities, and to register.